Today, I wanted to share some pictures of the backpack buddies that I bought for the kids. You probably already know that this is Parker's first year of preschool and Brady went to Kindergarten this year so it's a big one for us. I wanted to get my guys a little something special to keep in their backpacks so they know that they aren't ever alone at school. 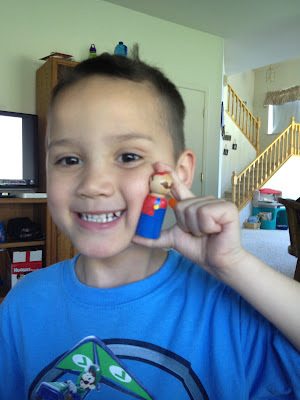 Then I remembered seeing adorable little custom peg dolls on my friend Jenny's blog so I ordered a couple for the boys. My kids LOVE their buddies and occasionally take them out in the car to look at them, however they are strictly for their backpacks so they don't really play with them. 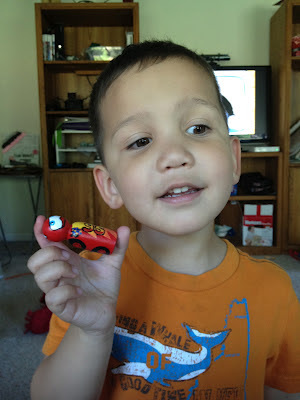 Here's Parker with his Lightening McQueen. Here's Brady with his Mario. Those are adorable. Not to mention the kiddos holding them!! oh my goodness. those are so cute!